Maggie McKitrick loves everything about her new life in Gibson’s Run, Ohio—Her charming bakery, her quirky customers, her distance from the past. Yes, she loves everything…except her new landlord. Police Chief Sean Taylor is like a piece of sand in an oyster— irritating, but with the promise of something beautiful. Despite Maggie’s self-imposed man-fast, she wonders what kind of treasure she and the lawman could create together. Sean Taylor likes to keep the peace, but his new tenant is making it nearly impossible to keep anything on an even keel– including his heart. Despite her sassy attitude, Sean is drawn to the beautiful pastry chef and has an overwhelming need to serve and protect her. As Maggie and Sean draw closer together, her long buried dreams about her life are reawakened into a hopeful prayer…until a threat from her past promises to destroy their future. Will Maggie be forced to run – again – starting fresh? Or will God answer her prayer and give her the happily-ever-after she’s started from scratch? The aroma of chocolate, intermingled with caramel, melted into Sean’s senses as he crossed the threshold of Only the Basics Bakery. The scents of the little shop enveloped him like a warm sweater in the middle of winter and he suspected any of the dozens of cookies, cakes, and pies on display would vanish as soon as they found their way onto a plate in front of him. He wished he could make the shop’s owner, Maggie McKitrick, disappear as quickly. Echoing from the backroom, the voice was faceless, but Sean would know its lilt in his deepest sleep. It sent chills up his spine each time he pressed play on his answering machine. He was certain said voice, and the petite body housing it, had nagged nearly an inch off his over six foot frame in the last few months with complaints, threats veiled as needs, and ridiculous upgrade suggestions for the building the voice’s owner rented from him. “I’m so sorry you had to wait,” she said as she pushed her way through the swinging door that separated the cozy café from the cramped kitchen. Her eyes focused on the floor as if she needed to measure each step. 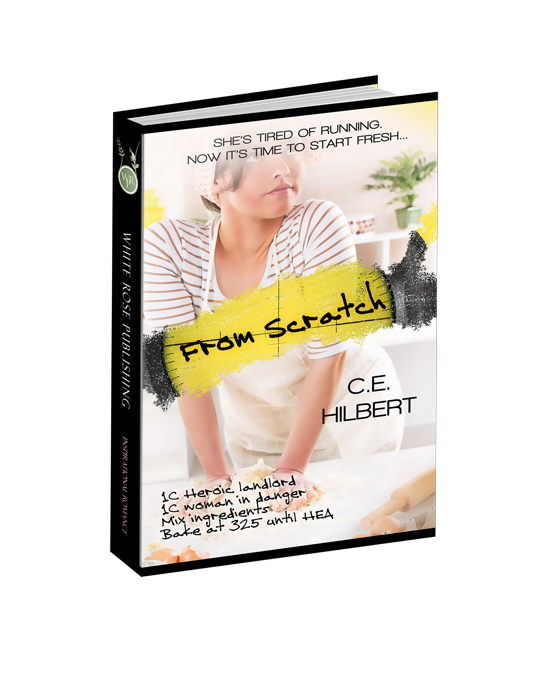 Wiping hands on her flour-covered apron, she lifted her head—lips stretched wide with a smile, and stopped just behind the counter. Only the glass display case separated them. “It’s me.” Sean couldn’t stop his lips from lifting at the corners. “Perhaps, it’s because each time I send someone over to fix your problems, you smile at him, hand him a muffin, a cup of coffee, and offer him a seat in your café.” He stepped to the counter, resting his palms on the smooth, cool surface. “Taylor.” Silently he prayed for calm. “Whatever,” Maggie muttered. Turning from the display case, she began wiping an undetectable mess on the back prep counter. The entry bell jangled announcing a new customer. Sean shelved the speech he was preparing in his head. No need to have the whole town gossiping about his landlord-tenant issues. Maggie’s expression sparkled as she looked past him and greeted the new distraction. “Hello, Mr. Mayor.” She skirted around Sean. Reaching the mayor, she shook his hand. He was surprised she didn’t tug the good ole’ boy politician into a bear hug, spreading flour across the crooked tie and rounded belly of Gibson’s Run, Ohio’s fearless leader. Sean tightened his arms across his chest as he watched her exuberant greeting. She seemed to love everyone. Everyone but her landlord. “Good morning, Miss Maggie. How’re you today?” The mayor said with a nod of his head and a chuckle in his voice. “Oh, I’m OK, Mike, except for some… umm…difficult customers.” She rolled her eyes toward Sean. “How’d you like a blueberry-lemon muffin? They’re cooling in the back. I made them with organic sugar, unbleached flour, and substituted butter with Greek yogurt. So Beth should be all right with you having a little treat for breakfast.” Without waiting for his answer, Maggie scurried to the back kitchen leaving Sean and the mayor alone. “Chief…” the mayor said with a slight tip of his head to Sean. “I’m just fine, Sean.” He took a step toward the display case. Rubbing his belly, he perused the decadent contents. “I hope you aren’t harassing our sweet Maggie. Seems as if that might be against the law and a conflict of interest.” He turned his head and winked a single eye toward the badge Sean wore on his work belt. “I think it’s the other way around, Mayor.” Sean leaned against the small café table. This was business. He wasn’t leaving without his rent. “Thank you, Maggie. I’m sure the ladies will love them.” He lifted the box from her hands. “I’ll take a black coffee, as well, and then leave you and the chief to…” He looked from Maggie to Sean and back to Maggie. “Chat.” He handed her a few dollars to pay for his muffin and coffee. “Certainly,” Sean pushed off the table. “Have a good day, mayor.” The tiny bell jingled as he shoved the glass door open. “You can follow him,” Maggie said over her shoulder as she fiddled with the mugs on the shelf above the back counter. He felt heat burn at his collar and his stomach twisted. Sean hadn’t been following through with his responsibilities. His brothers trusted him to manage the properties they shared. The other stores and apartments in the strip of buildings the Taylor brothers owned were self-sufficient. Except for the occasional water leak or furnace filter, all he needed to do was collect the checks each month. But Maggie’s building was the oldest in their holdings and often needed the most attention. Her complaints were valid. He hated that she was right. “Deal,” Maggie said with a twinge of a smile in her eyes. He must have been mistaken. She shared smiles with everyone except him. “See you tonight.” Sean nodded his head in what he hoped was an authoritative manner. Shoving open the front door to exit, he prayed that the woman never committed a crime. He would likely allow her to convince him that he had forced her into the felony. Question 1: Maggie remains true to her faith despite having a spiritual leader deceive and disappoint her. How is she able to separate the human acts from her relationship with God? Answer 1: Maggie's faith is grounded in knowing God loves her - regardless of her name or life choices. Question 2: Sean is the middle child. Out of his birth order, he feels a strong sense of duty to his community and his family. How do you believe that shapes his actions toward Maggie first as his tenant and later as his love interest? Answer 2: Sean wants to maintain the distance to keep a sense of honor and "right" in their relationship. After he confirms his feelings internally, he wants to honor her by keeping their love safe and her safe. Question 3: Maggie's inability to trust those around her forces her to lie. Have you ever been put in a position where you believed it was best to omit the truth to keep someone else or yourself safe? Question 4: The Taylor brothers are very different yet they compliment each other. How does the wisdom - both direct and through sibling teasing - teach lessons only achievable through a brother or a sister relationship? Answer 4: Sean and his brothers keep each other grounded in the truths of love, faith and family. They have the ability to be honest with each other in ways that a friend may not have the same freedom. Question 5: Both Sean and Maggie are essentially orphans. How do you believe that has shaped their adulthood and influenced how they approach relationships? Answer 5: Both Sean and Maggie dealt with difficult losses at young ages, losses which required them to discover internal strength that they didn't know they had. Maggie reached out to others - Jack, Mitchell, Sam - to fill the gaps of security and love left by her parents but they all disappointed her in different ways making trust difficult in future relationships. Sean, conversely, had the support of his brothers, the Greys, his close friends, the town and even the police department - all of whom supported and loved him through the grief of loss. He never doubted that love could be renewed or restored because he'd already experienced it. Question 6: Friendship - and the distinct bonds between women - is a them throughout the story. What distinguishes Maggie's and Jane's relationship from Maggie's and Jenna's relationship? How can you relate to the different relationship nuances? Question 7: When Maggie first sings in public, she is overwhelmed by the indwelling of the Holy Spirit. Why do you think she reaches out to Henry Grey for fatherly support in that moment? Answer 7: Maggie has a different hole in her spirit than most. She lost the unconditional love and approval of her earthly father during a time when she needed ongoing support and encouragement. The simple gift of Henry telling her that her father would be proud of her granted her a deep wish she was unaware she even had. Question 8: Both Maggie and Sean actively converse with God. How do you believe that ongoing conversation influences their actions? Answer 8: At various points in time, it is through prayer that both Maggie and Sean have both large and small truths revealed to them. Question 9: Sissy Jenkins is a gossip. Although gossip is a sin, her nosey tendancies gave Sean the information he needed to save Maggie. How does the transformation of Sissy's sin to an act of righteousness reflect Romans 8:28? Answer 9 God can and will make good of all things - even those that are misguided. Question 10: Maggie is often in emotional turmoil, shifting into extreme panic or fear do to the past decade of her life. How does the conclusion of the book allow her to feel the transforming grace of new life in Christ? Answer 10: For the first time since she left Mary-Margaret behind, she is able to embrace who she is and who she was - not as two people but as one person. This is the gift we have in Christ. The old is new and renewed. We are the same persons and yet we are new creations in our Savior.